What is that which gives me joy? Gangster roles! 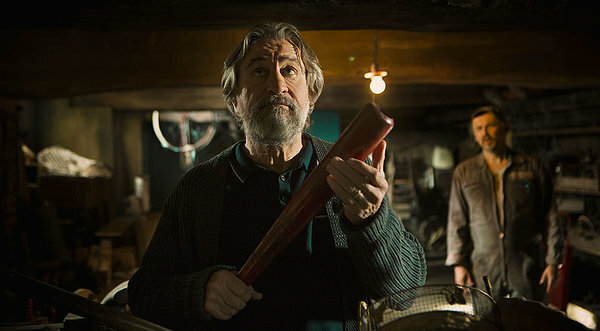 One scene binds the satirical layers of French director Luc Besson’s The Family. 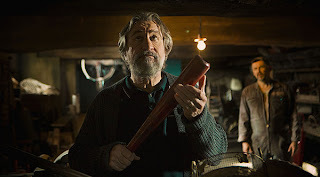 Playing a former Brooklyn mob boss now posing as a writer under federal witness protection in a remote village in northwest France, Robert De Niro is invited to a gathering of the town’s local film society. When the night’s original featured film, Some Came Running, falls through, its replacement is another distinctly American film from “Monsieur Scorsese.” And so we see an aging De Niro, the flicker of a film projector haloing his head, smiling wryly at the opening moments of Goodfellas. Here, Besson encapsulates the whole of his adaptation of Tonino Benacquista’s novel “Malavita.” First, the film is an elegy to the glorified American movie gangster, embodied in the visage of a goodfella who didn’t stay on top or die living the life, but instead chose to snitch on his mob family in order to save his real family and now wiles away his later years in foreign exile. Indeed, it’s not a stretch to analogize De Niro’s Giovanni Manzoni—living under the assumed name Fred Blake—to Henry Hill about 16 years after the end of Goodfellas. The film also spotlights the French’s simultaneous abhorrence of Americans and adoration of American culture. When the Blakes host a cookout, the neighbors line up to sample hamburgers and other American cuisine, while at the same time snobbishly sniffing at Fred’s attempts to ignite his charcoal grill. When Fred’s wife Maggie (Michelle Pfeiffer) dares ask a local grocer if he stocks peanut butter, the faux pas is met with a string of whispered insults that Maggie answers by blowing up the store. Beyond the provocative allegory, what keeps the film entertaining is its knowing casting and its breezy, offbeat comedic script. While the Blake clan may have moved overseas, they brought their mob mentality with them. Normandy is only the latest landing spot for Fred, who has been uprooted by his federal minder Robert Stansfield (Tommy Lee Jones) several times due to Fred’s anger issues. Warren (John D’Leo) is a hustler in training who begins working the angles the first day at his new high school. Meanwhile, teenage daughter Belle (Dianna Agron, a long way from Glee) is an acute mix of her mother’s beauty and her father’s hair-trigger temper. There’s a subplot involving Fred’s investigation into local water supply (perhaps a nod to Chinatown), as well as his attempt at writing his memoirs using an old Brother typewriter, an endeavor dissuaded by Stansfield. Even a seemingly throwaway aside by Warren about the varied uses of the f-word is slyly revisited following a film-ending cataclysm. It’s no secret that Besson’s films, and the Cinéma du look French film movement he helped form, are heavily influenced by New Hollywood cinema and modern Hollywood action movies. In this way, The Family—particularly its violent final act—is also Besson’s sardonic response to the longstanding criticism that his work is too slick, commercial and “Hollywood,” lodged by countrymen harboring their own predilection for Yankee pop culture.